Electricity meters are around since many decades now. An electricity meter measures the electrical consumption and displays it on the screen. But we are used to the electricity meters (electromechanical or electronic) which measure the total electricity consumption of the entire house or office. But what if you want to measure how much your air conditioner (or refrigerator, washing machine or any other appliance) is consuming? This is where a Kill A Watt meter steps into picture. What is a Kill A Watt meter? A Kill A Watt meter (originally a KiloWatt meter) is a device which is capable of measuring the electricity consumption of the appliance directly connected to it. It was first manufactured by P3 International. It has a LCD display which shows various readings like voltage, current, true power, reactive power, apparent power, power factor, energy consumed in kWh for the connected appliance. Some models also display estimated cost pertaining to the number of units consumed. How a Kill A Watt meter is used? Using a Kill A Watt meter is quite simple. It has to be installed in the line between the power supply and the appliance (of which you want to measure the electricity consumption). Suppose you want to measure the electricity consumption of your refrigerator. Unplug power cable of the refrigerator from the power source and plug it in the port in the Kill A Watt meter. Now plug this Kill A Watt meter in the power point. That’s all! Leave it as it is for a few days (or hours, whichever is suitable to you) and after that, you will see that there is a reading on the LCD screen of the Kill A Watt meter. You can view other readings like voltage, power factor and most importantly, you can see how many kWh (or units) your refrigerator has consumed. 1. P4400: The first and the most basic version of a Kill A Watt meter. 2. P4460 Kill A Watt EZ: The biggest shortcoming of a Kill A Watt meter is that it cannot store information. Its memory lasts as long as it is plugged in the power supply. As soon as it is unplugged from the power supply, the numbers/readings on the LCD screen disappear. To deal with this, this particular model includes a backup battery which enables it to store the information after it is disconnected from the power supply. So you don’t have to write down the readings manually. 3. P4320 Kill A Watt PS: It is a more advanced version of the basic Kill A Watt meters. It is integrated into an eight-outlet power-strip. So it is capable of protecting against power surges and can also measure leakage current. 1. It is a small and handy device for measuring electrical consumption of any electrical appliance. Unlike the home energy meters, it measures the consumption of an individual appliance giving you useful information about the performance of your appliances like efficiency (you can also check derating of an appliance). 2. It is very easy to use. It does not have any wires and can simply be plugged in the power point to have a complete information about the behaviour of a particular appliance. 3. It is quite useful in determining the stand by power (or vampire power or phantom power) of an appliance. 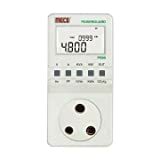 Although it dose not measure it to a high degree of accuracy, but it is way better than many regular meters which have a least count of 1 kW whereas a Kill A Watt meter has a least count of 0.1 kW. Where can you buy a Kill A Watt meter? A Kill A Watt meter can be purchased from online portals like Ebay or Amazon. A typical meter costs around Rs 2500 ($40 approximately). The cost may vary according to the different features available in it. When buying a Kill A Watt meter make sure that the “Amp rating” of the appliances you are planning to connect to it are not higher than the Kill A Watt meter’s Amp rating as the meter may get burnt because of it. You should only connect those appliances which have the Amp rating lower or comparable to the Amp rating of the Kill A Watt meter.